You can picture out the occurrence of the events where speed and fast data was vital. The inventory has a long list out of them few are – process optimization, critical power issues, asset management, predictive analytics to the real-time needs of supply chain management software and many more. Building more requires fast data and real-time holistic management in any context. Expeditiously analyzed and leveraged accurately data become valuable and essential in many industrial IoT applications. A report senses a growth rate of over 25% annually in the North American IoT security market. 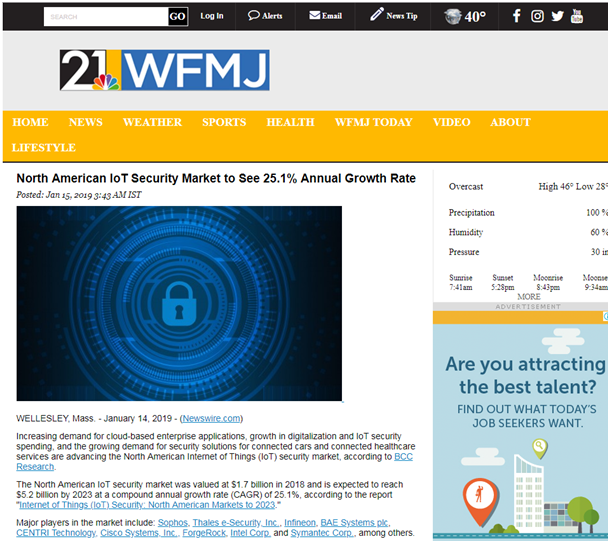 The was $1.7 billion in 2018 which is expected to rise by $5.2 billion by 2023 at a compound annual growth rate (CAGR) of 25.1 percent, as reported by ‘Internet of Things (IoT) security: North American Markets to 2023’. IoT has overpowered the traditional approaches in real-time information in the increasing unstructured data inundate because of their remoteness and costs it takes to send data. Thus, the need for swift processing and networking, raised cloud adoption increased number and dependency on IoT devices drove the market towards the edge computing. Dutch satellite company Hibe is all set in launching Q1 2019: Hiberband – the low power and cost global area connectivity network. These nano-satellites over the next few days will deliver connectivity to remote locations around the world. The company also hopes to launch a dozen shoe-box size satellites in the next 18 months to form connectivity from the modems and antennas owned by the customers directly. Swamping data on the cloud has created its own set of issues. Security was at risk to identify the level of accessibility in a business where delayed data caused disruption. Here is where edge computing emerged to unburden the deluged data which has slowed the processing of the cloud. The decentralized processing powered with mobile computing and IoT technologies, edge computing is an open IT architecture which involves local servers for data processing instead of transmitting the data into the cloud. Edge computing and IoT have been a great match from decades which is about shifting intelligence to the edge of IoT. IDC predicts that approx 40% of IoT data analysis will be done on devices close to the business premises within the next four hours. This just doesn’t solve everything, as innovation comes in a rife. The challenge is deciding which short-term or long-term organisational and operational data needs to be accessed? How can suitable vaults be created for their data to store? With a large amount of data collected from numerous devices, industry-specific regulations and some best practices are being used to implement IoT, as details can make all the difference. Likewise, the worth of edge computing in healthcare will continue to surge with the rise in the healthcare data. IoT has emerged as a protagonist in healthcare scenarios like monitoring heart and patient, ultrasounds, cancer treatment planning system and all kinds of medical devices. 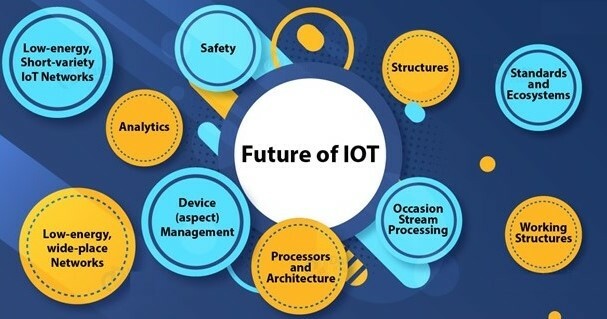 By the end of this year, IT will approach towards incorporating IoT and edge computing technology that would mould the IT architecture which will help in establishing asset management software and a methodology for tracing and tracking the IoT devices which get parked at the edge. Thus, adhering to these practices would impact traditional data, asset and network management. It is highly challenging for IT to monitor every piece of IoT computing at the edge. Here is where the users come into place, they will be running the localized edge computing applications like IoT. Also, users understand better to implement IoT according to the needs of business performance. This partnership with the end users and IT will help reduce the unfavourable impacts of shadow IT. Users without the knowledge of IT have a risk of security, thus this collaboration between IT- end users assure the corporate security practised on the edge. With a keen interest in flourishing their business, it is really difficult to convince users of the concepts of security and governance, especially when they are not versed with IT. Thus, organisations are shifting towards zero trust network to make sure that no one enters the network without undergoing the security criteria. Without having to pay a visit only necessary are permitted. Oracle launched its latest version of Java Card, which secures the world’s most sensitive devices. The Java Card 3.1 is an expansible version for more flexibility to meet the security needs with special hardware in the current secure chips and the upcoming IoT technologies. The Java Card 3.1 works to address the use case across market varying from telecom and payments to cars and wearables. 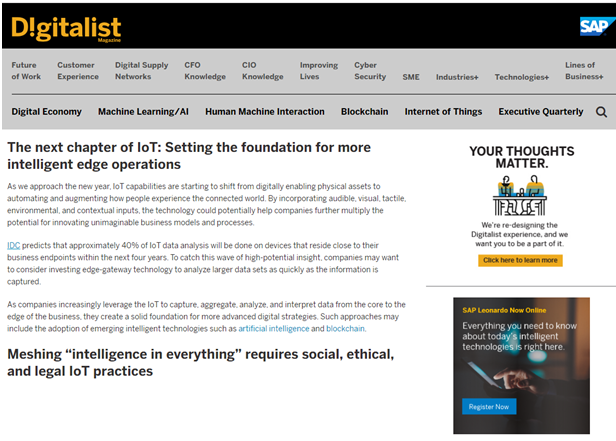 With automation, predictive analytics and decision making IoT at the edge bring companies some offset features that humans do. This cultural shift of human to the machine then retrain personnel to understand and feel confident in a revised version. Likewise, “the US Air Force combined with Lockheed Martin Skunk Works to display manned/unmanned collaboration to enable rapid action during combat.”– said Mark Cole business strategy and development ISR and UAS, Lockheed Martin Skunk Works. “Cities used to invest in roads, rails and airports; the infrastructure of the future to attract investment is digital,” said Knox White, Mayor of Greenville, S.C.” Sprint’s Curiosity IoT with mobile 5G is readying cities to attract the business of the future.” Sprint plans to deliver a smart city and driverless car labs using Massive MIMO technology in addition to dedicated, distributed, and virtualised IoT core network skilled in assisting AI, robotics, edge computing, autonomous vehicles, and other IoT system for high-bandwidth. Focus and agility are the key compounds to make an edge computing transformation successful. Certainly, it is difficult for a single component to deliver computing power or store the necessary data. To resolute the overwhelmed cloud or company’s mobile networks, a platform is created from the edge devices which can absorb the vast data in a matter of time. Only the necessary data must be retrieved at the time of making operational and better decisions likewise providing alarms, predicting threats etc along with some real-time situational data. Ashley Marsh is a senior content writer at Maan Softwares Inc. She has been writing for various companies for over four years on a variety of topics. Ashley specializes in technical writing with an emphasis in mobile development, web design, and technology trends. Ashley finds covering the tech world to be an exciting and engaging experience as each day brings new and groundbreaking technologies to explore and write about. When she’s not writing about tech she enjoys walking her two chihuahua-poodle mixes, Ginger and Pepper.